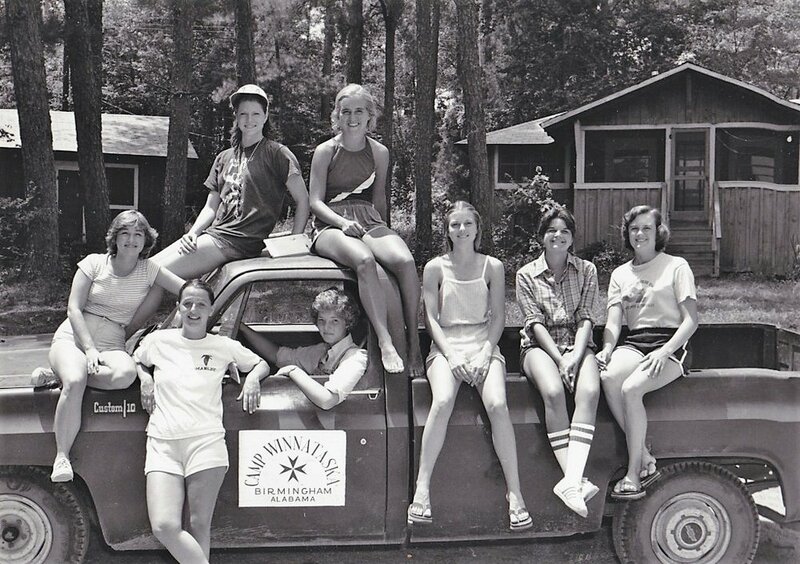 Camp Winnataska's history began as an afternoon excursion in a Model-T Ford. Lured to the site by a promising fishing hole, Dr. Elwyn Ballard and his wife, Florence Aye Ballard, were enchanted by the waterfalls that are central to Camp today. A couple of years later, in 1918, Winnataska welcomed its first campers, boys and girls, who boarded a train in Birmingham and hiked the last five miles in their best traveling clothes. One hundred years later, fourth and fifth-generation campers related to the Ballard family, and the first campers of 1918 still attend Camp. Winnataska is a true historical treasure in the Southeast and perhaps most wonderously, is still welcoming first-generation campers every summer. Taken from an old scrapbook, the caption to this photograph reads, "Walking to Brompton station, 1919. Binnie Ruth Glass leading the group." In 1997, the Alabama Historical Association placed a marker near the camp gates. “Dr. Elwyn Ballard, Commissioner of Boy Scouts in Birmingham, and his wife, Florence Aye Ballard, discovered this site in 1914, and became vital forces in the founding and growth of the camp. Boy Scouts and Boys Club members from the area first camped here in tents in 1916. Through Dr. Ballard, the Interdenominational Birmingham Sunday School Association acquired the camp in 1918 and offered sessions not only for boys but for girls as well - the first organization-sponsored camping for girls in Alabama and among the first in the South. Daniel Ray Price, Executive Secretary of the Association, directed the camp from 1922-1957. Rosa V. Strickland, educator and church leader, served as girls camp director 1919-1954. Winnataska early received national recognition for excellence of staff, facilities, and programs." Cascading through the middle of camp, Kelly Creek has remained an integral part of a camper's experience. The name Winnataska means "Land of the Laughing Water" in native Creek tongue. This iconic photograph shows campers from the 1920's swimming in the creek, as campers still enjoy doing today. Also pictured is Rosa Strickland (lower left), who served as a girls camp director for several decades. Strickland Lodge, where the Camp Store is currently being housed, is named in her honor. Camp remained strong through the Depression-era and beyond because of alumni commitment to its cause. Over the years, thousands of volunteers have given time, energy, talents, and monetary donations to keep camp running. This brochure from 1966 is an excellent example, as it shows D.R. Price speaking at Wayside to campers. Mr. Price served as a director for many years, and his family members continue to volunteer at camp. Fridays at Camp Winnataska mean the most important and tradition-rich night activity of the week. 1922 marked the beginning of what was to become a landmark of Camp Winnataska. This was the first year the pageant of "Holy Grail" was given. A select group of leaders and staff are chosen as the cast. The play depicts the legend of King Arthur and his knights of the round table, focusing on their search for the Holy Grail, the cup that Christ drank out of at the last supper. Sir Galahad, the purest and best of all the knights, received a vision of the Holy Grail, "...it seems to call me and I must follow." Sir Galahad then followed his vision and, through much peril, found the lost chalice. In his travels, he came to a road of seven bridges. He crossed the first six bridges in safety, but, LO!, as he set foot on the seventh bridge, it burst into flames. Sir Galahad was lifted into heaven, holding in his hand, the Holy Grail. Being chosen as a member of the Grail Cast is a great honor and reward. Being chosen as Sir Galahad is the highest honor given to the staff member or leader that is the purest and best. The pageant is performed by the staff, while the Blackfeet prepare to rebuild the seventh bridge after it bursts into flames. The campers are challenged to search for their own Holy Grail and to "Follow the Gleam." This song is sung at the conclusion of every Hillside. Indian Night has been held at camp since its very first year. Many of the original elements are still a part of what campers experience. For example, four smaller fires are lit to the four winds, and the Great Chief still offers prayers to the Sunset Wind, the Winter Wind, the Sunrise Wind, and the Hot Wind. The Legend of Winnataska, which is read at the end of the night, was penned in 1927 by Tommy Waldrop. She used the measure of the he famous Henry Wadsworth Longfellow poem, "Hiawatha" as a guide. Before campers depart, they hear the singing of "Pale Moon," which was a very popular song in 1924. Get involved! If you are a camp alumni who wishes to receive emails and updates from camp, please submit your information below. Happy 100th birthday, camp winnataska! Mark your calendars for July 4, 2018 for a celebration at camp!